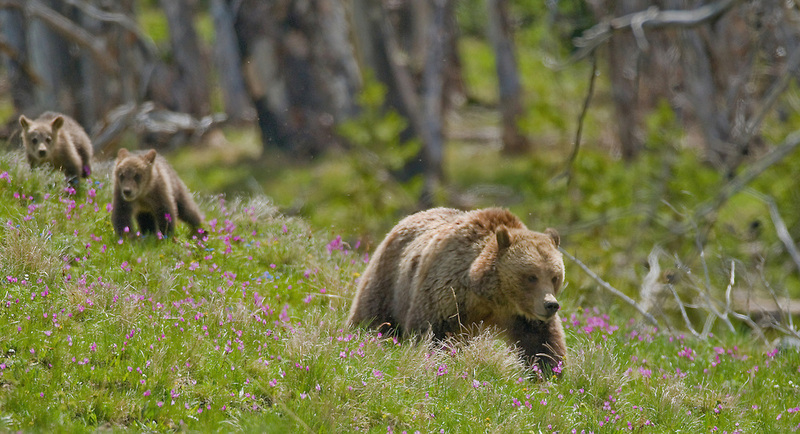 Atop Dunraven Pass in Yellowstone Park, a mother grizzly leads her two cubs through a meadow filled with shooting stars and alpine forget-me-nots. Although born in the same litter, these cubs may be only half-siblings since the female grizzly can mate with several different males during breeding season, producing cubs with different fathers. Grizzly bear Ursos arctos sow cubs mammals animals wildlife nature meadow flowers shooting star summer Yellowstone National Park Wyoming.